January 2016 to January 2017. The LA Department of City Planning and LADOT are developing a marketing and safety campaign for the MyFig Project, with Metro funding, to prepare its community partners for the upcoming changes to the corridor. The City hopes to partner with USC to create a dynamic and engaging multi-media safety campaign to educate the USC campus community on safe operation of the MyFig protected bicycle lanes, bike boxes, transit islands, and other features of the streetscape design. 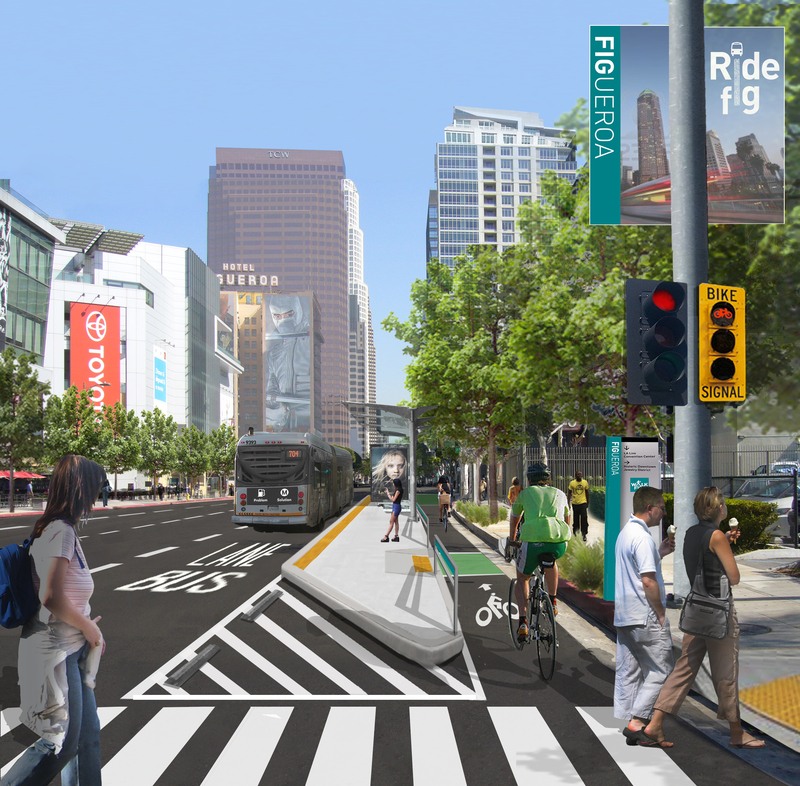 The MyFigueroa Streetscape Project proposes to remake three (3) miles of Figueroa Street from the USC Campus to Downtown into a safe and attractive multi-modal complete street. The Project includes the city’s most high profile protected bicycle lane, also known as a cycle track, which is separated by a physical barrier from vehicles in adjacent travel lanes and generally located between the parking lanes and the existing curbs. Protected bicycle lanes appeal to less experienced and less confident cyclists more than standard bicycle lanes by providing greater user safety and comfort as a result of the more robust separation from traffic. In cities that have installed this type of design treatment, post-evaluation performance surveys demonstrate that protected bicycle lanes increase safety for all road users, reducing collisions involving pedestrian and bicyclists as well as those involving only motor vehicles. In the area near USC, the protected bike lanes from Exposition to 21st Street on Figueroa will help accommodate heavy volumes of cyclists and greatly reduce sidewalk riding, which poses hazards to both pedestrians and cyclists. 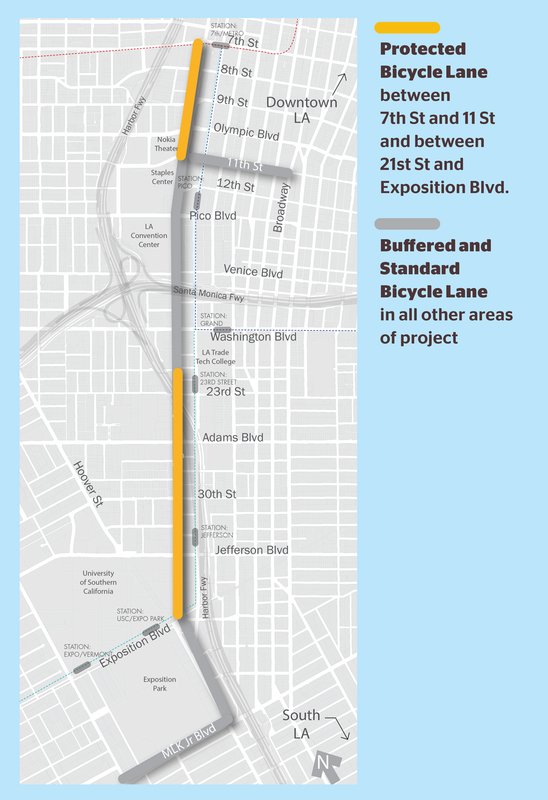 Some segments of the Project, south of Exposition Boulevard and from 21st Street to 11th Street, would include a combination of standard and buffered bicycle lanes instead of protected bicycle lanes. Buffered bicycle lanes do not include physical barriers but include a painted buffer between the bicycle lanes and the adjacent travel lanes. 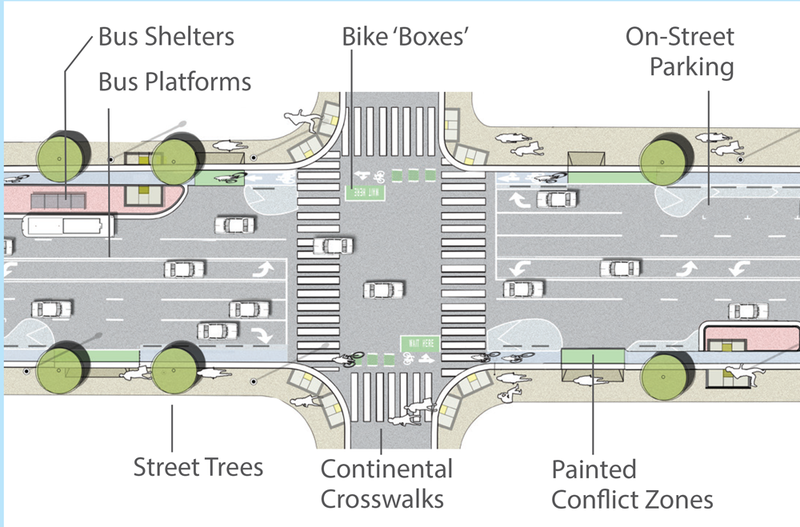 Other design features include modifying traffic signals to add separate bike signal heads, and using colorized pavement at through intersections, in conflict zones such as driveways and in bicycle/vehicle and bicycle/pedestrian mixing areas.